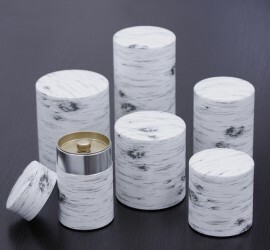 The White Birch Tea Tin Canister is hand-wrapped in traditional Japanese washi paper. Our original birch design washi paper was hand-dyed in Kyoto, Japan. Washi paper is made from the bark of small trees found in Japan and has a soft, comforting texture. Exactly like white birch and aspen, just looking at the White Birch Can will give you the refreshing feeling of being in the middle of nature.